After horsin’ around the cowpokes can explore the ranch or play games in our game room, complete with a pool table and darts. In the West, ranch life starts at a young age; whatever your age, the Bar W has a great vacation waiting for you. At the Bar W, we believe experiences are meant to be shared and consider children to be the heart of the ranch. We’ve designed an impressive cowpoke program for cowpokes ages 4-6 years along with our Junior Wranglers 7 years and older. Throughout the week children will immerse themselves in the rich history of cowboy culture that they’ve read about in books and watched on TV. The kid’s program is designed to allow parents the freedom to experience all we have to offer while being confident that their child is receiving the best care with our kid’s counselors and making lifelong memories. For the small fries, under three, we offer limited babysitting upon request so the adults can enjoy the trails together. Cowboys and cowgirls under seven can become official Bar W Cowpokes. Our Cowpoke program allows kids to enjoy horseback riding and experience a variety of Montana oriented activities. Cowpokes will enjoy pony rides, arena games on horseback, horsemanship lessons, scavenger hunts, Montana bingo, arts & crafts, and even can become a “Montana Picasso” as they paint a horse! Junior Wranglers, age seven to eleven, will enjoy rides with adults as well as special Junior Cowpokes Rides for any child that does not want to do longer rides with their parents. Junior Wranglers will enjoy miles of trail rides and games in the arena. Lead by counselors, each cowpoke team will experience great adventures including horseback riding, swimming, fishing, and exploring Montana country. 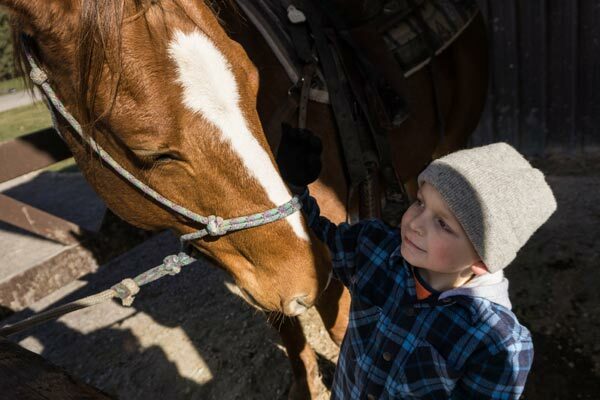 Learn the Ropes – Children will have educational components throughout the week incorporated into the fun and will learn how to groom, saddle, and care for a horse. Cowpokes will meet the stars of our ‘cowpoke corner’ which include traditional ranch animals such as goats, chickens, ponies, and our favorite ranch cat- Albert. 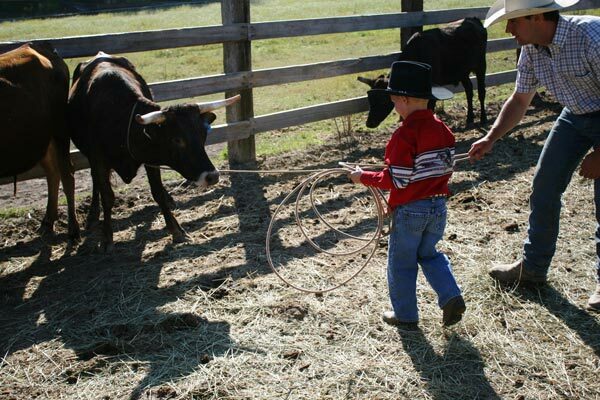 Children are invited to help with ‘cowpoke corner chores’ including gathering eggs, grooming, feeding, and cleaning the pens. Children are welcome to take a fly casting lesson and fish for trout in our stocked pond. Saddle up – Cowpokes between two and six years old are welcome to enjoy led pony rides around the ranch on our kid tested and approved ponies, Flower and Flash! For the small fries, under three, we offer limited babysitting upon request at an hourly cost. Junior Wranglers, age seven to eleven, will enjoy rides with adults as well as special Cowpokes Rides for any child that does not want to do longer rides with their parents. Junior Wranglers will enjoy miles of trail rides and games in the arena. Play – Horsin’ around is our favorite pastime. Kids can participate in square dancing, attending a local rodeo, wagon ride dinners, roping lessons, a country singer (who knows lots of interactive kids favorites). Classic western favorites such as sack races, egg tosses, and a round of horseshoes develop friendships and incite plenty of laughs. Create – Children of all ages enjoy stretching their creativity during arts and crafts. Making their own “Wanted” poster, painting a horseshoe, and tie-dying a shirt are perfect mementos of their dude ranch vacation. The always popular “paint your horse” session turns a horse into a decorated equine canvas. During the Tuesday evening kid’s dinner cowpokes roast marshmallows and indulge in the traditional Western dessert – s’ mores. Roam – Children are invited to explore the entire property. This dynamic is a personal favorite of the owners, Dave and Janet. The idea is that kids, (age appropriate of course) learn to run free and parents learn to let them and let go – a little bit at least. Ride bikes, catch frogs by the pond, climb on the hay bales, and be a little free range. Parents will have the opportunity to participate with their kids in some of these activities. Additionally, the cowpoke program incorporates time throughout the day where families gather over meals to share the highlights of everyone’s day.